ConnectingSingles is a completely free online dating site for singles. You can browse profiles for free, sign up for free and contact other prospective matches for free. Locating others is quick and easy with the help of the site's area/zip code locator. There is a simple tool that let's you find others in the same locale or expand their horizons and search through international profile listings. Members can not only make free contact, they can use the Send Flowers option to let others know they're interested. Users have bookmark and block options, along with the ability to see who's been viewing their profile lately. The huge range of features and options on the site does make it a bit bewildering at first. Though things like polls, games and picture rating do keep people engaged. Even though you might not find your next spouse there this is quite a popular site. There's enough activity there that you should at least be able to strike up a few conversations with some interesting people. Even though you might not find your next spouse there this is quite a popular site. With no costs to worry about, ConnectingSingles a nice option for those just curious about the world of online dating. There are no gotchas or binding contracts to sign. The site is easily navigable and offers members the chance to get involved and mingle via forums and blog postings. Rss Feeds. Subscribe to comments for this site. [?] Receive updates about Connectingsingles.com directly through your newsreader. Profiles on CS must be posted by a bot or someone paid to write them! Because lots say stuff like " I work 3 days a week at a fast food place making burgers and cleaning up and make a hundred and fifty thousand a year and then when they don't answer you for days all they say is I'm still here and it's rare that I ever see any new people on CS! Same girls on here means no one is meeting anyone and leaving the site! There are a lot of scammers on a dating site, many using photos of models and actors/actresses. Most members are from English-speaking countries, so it's practically useless for others, although it is advertised as an international dating site. Don't try to meet anyone on forums, blogs, poetry... Most profiles are fake - either their photos or profile info or the story about their lives or - everything. Most of them are members for many years and use several profiles. Rarely anyone is younger than 60, there are many married people, drug and alcohol addicts, people with mental health issues... If you enjoy a good soap opera, you might watch from the outside, read and laugh at their petty fights, gossips and imaginary life stories. If you decide to jump in and join - don't be honest and real. And don't communicate with them privately. A good free entertainment, but nothing more than that. The best part of this dating site is that it is completely FREE, easy to join and to use. You don't even need to verify your e-mail address. I've been a member of the site for years with breaks. I haven't had a single date on Connecting Singles during these years. There aren't many women of my preferences in my area and there are many scammers (beautiful women who look like models). Each time I went back there - I constantly encountered the same old profiles (some were very old and the ladies hadn't logged in for many years). I stayed for the entertainment - quizzes, forums, blogs, but they got less and less fun over the years. The number of members writing actively dropped each time I logged in (after months or weeks of absence) and I constantly encountered private fights of long-term members. I tried writing a bit, then was contacted by some strange women, many a lot older than me. The entertainment part of the site is useless to meet anyone and the dating service isn't so good either. It's also a very old site, not phone-friendly. There are better options for online dating today. I think this site saw its better days and if it doesn't get improved - I don't see many new members joining in. This is the only site I have used. My pre-joining assessment of this site was fully realized, but that says as much about me, and where I live, as anything. In three months I got 266 clicks, 3 'Hi's', and 1 'Hello' from 3000km away. I also received a constant supply of third world brides in waiting and scammers. I found the site easy to work out. The 'Search' function worked easily. Despite rules to the contrary I noticed one site using a magazine cover and another with a cartoon as their image. Since using a fake photo is so easy only the honest are. I ignored any post without a photo. I was surprised by the amount of entertainment. As one long out of the dating scene I read most of the articles for guidance on modern behaviour. None was boring. I came to no harm. I was surprised by the collective poor level of grammar and expression, even amongst those claiming a high education. It is not an attractive look to me. I am rejoining the site with blocks enabled this time. My expectations are no higher but I will get less noise in my email this time. I'm so disappointed with this site. So many liars, fake profiles, mean and crazy people on forums and blogs. I didn't know what "online gangs" and "cyber bullying" were before joining that website. So many mentally unstable men! So many trolls who use multiple profiles! Avoid this place - if you want to keep your sanity and don't want to become scared of meeting people online. After my experience with this website, I have no courage to join another similar one. Dusty photos. The women on that site mostly have not logged into their accounts since the Truman administration. It's a shame because it is one of the few sites I find with a mix of ethnic women. They have a really bad attitude, deleting perfectly good profiles just because a man is in shorts. There is no way to contact these people and they really are complete control freaks. The site will never grow with this attitude. What I cannot understand is why ex members diss this site, then return with fake profiles, trolls, and cause trouble. If you do not like the site stop stirring, and leave it for good. This is the worst dating site in the world, my account was deleted for no reason. I joined the site a few hours ago and it was deleted seconds ago. 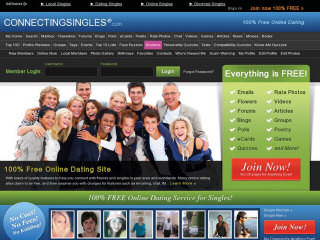 ConnectingSingles 1.82 39 A review of ConnectingSingles. Connecting Singles is a dating and forum website that's free to use.